The collapse of Thomas Bouch's Tay Bridge in 1879 and the enquiry that followed, lead to the abandonment of his twinned-spanned suspension bridge already under construction in the Firth of Forth. Instead, the North British Railway company consulted William Henry Barlow (1812-1902), railway engineer Thomas Eliot Harrison (1808-88), Sir John Fowler and Baker concerning possibilities for an alternative structure. The original proposal was modified by Baker and Fowler and this is the bridge we have today — the Forth Rail Bridge (1882-1890). However, the design undoubtedly owes its inception to Baker. The proposal was for a series of cantilevers with simply supported central sections, an idea Baker had written about in On Long Span Bridges in 1867 as the strongest, most easily constructed design. The railway company, still reeling from the Tay Bridge disaster, accepted this ingenious and sturdy proposal, despite the enormous spans and use of the new material, steel. For an account of the bridge's building, see Building the Bridge. 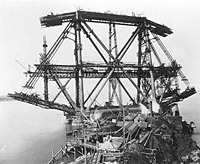 The bridge took eight years to construct, with Baker in almost constant attendance monitoring construction, testing the weathering of iron and steel and measuring wind loads  the Tay Bridge disaster had lead to new wind loading guidelines of 56lbs per sq ft, bringing Britain into line with other countries. Although Fowler designed the approach viaducts, the bridge is Baker's masterpiece. His mathematical genius and deep understanding of the material properties of steel meant that every detail of the structure and its construction were thoroughly analysed and anticipated. 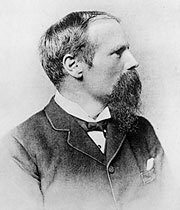 Baker was also fortunate in working with the great bridge building contractor William Arrol (1839-1913). Arrol was Baker's contemporary and a man of incredible energy and creativity. Where a problem of construction arose he provided a solution, inventing new machinery and methods to speed progress. After this fruitful collaboration, the two men worked together on many other bridges across the world. "The formal opening to-day of the Forth Bridge — one of the greatest monuments of engineering skill the world has ever seen — by the Prince of Wales — has been characterized by a noteworthy absence of pomp or parade." The final rivet was fixed by the Prince of Wales (with Arrol in close attendance) on a disappointingly foggy day, and Baker was knighted at the huge opening ceremony. The bridge was the newest wonder of the world and the many dignitaries, including the French engineer Gustav Eiffel (1832-1923), marveled at its scale and modernity. Even during construction the bridge had been a magnet for people from all over the world, part a of a new kind of Grand Tour. The Forth Rail Bridge has become an icon of British design, original and daring and very much still admired today. It was the largest cantilever span and largest spanning bridge in the world at the time of its construction, and the first large scale use of steel in bridges. See also the article, The Forth Rail Bridge, by Mark Whitby and Scott Lomax. The Forth Rail Bridge is Baker's masterwork. It was the largest cantilever span and largest spanning bridge in the world at the time of its construction, and the first large scale use of steel in bridges. Construction of the enormous cantilevers.